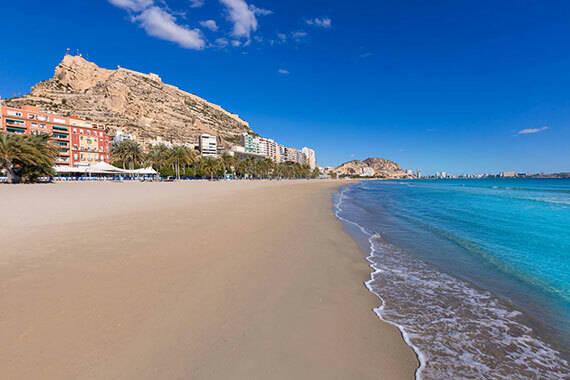 Alicante belongs to Costa Blanca, and is connected to: Benidorm, Calpe, Denia, Relleu, San Juan de Alicante, Tabarca, Teulada and Torrevieja by taxi transfer, car, bus and/or train. To get to know all that Alicante has to offer these days from museums and traditional restaurants to beautiful Alicante beaches and much more we recommend that you hire a car using our web site. It’s simple and economical. In the 16th century the population of the city increased greatly due to an increase in commerce, export of crafts and a boom in local agriculture. During this period two new areas of the city began construction, San Francisco and San Anton. The population of the city doubled in size from between 1510 and 1609. During the 17th and 18th centuries the port sparked the urban transformation of the city to handle the growing trade with America. Also a Consulate of sea and land was created to improve agriculture and maritime navigation. In 1797 the city population had grown to 20,000. In the 19th century the city walls were demolished and new neighbourhoods built along with the arrival of the railway and in the 20th century the city developed as a service and tourism centre. There is also evidence of a roman city on the site of Alicante which was known as Lucentum. The first Moorish town here was constructed at the foot of the Benacantil hill for better defence against invaders and later Alicante became an important port and centre of commerce. In 1244 the Almizra treaty was signed to set the borders between the regions of Castilla and Aragon including Alicante. Three years later in 1247 the city was conquered by King Alfonso X who constructed the “vila Nova” or new city. In 1296 King Jaime the second included Alicante as part of the kingdom of Valencia and in 1490 Fernando the second defined the city limits. Below you can browse more information about Alicante and the surroundings. Explore and enjoy Alicante! Attractions, monuments, museums and information for your visit. Information, how to get to Alicante city. Wondering what the weather will be? Experience the night in Alicante. Alicante airport arrivals, departures, transfers, services and information. Alicante car rental resources and information.